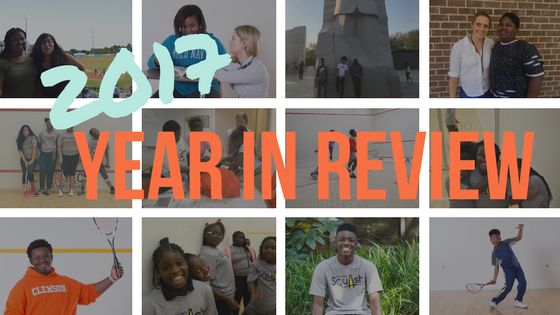 Our organization started 2017 as Chucktown Squash Scholars and ended the year as Kids On Point — 2017 has been a big year for us! Kids On Point has seen a few major accomplishments this year, but most importantly, we continue to see youth grow and be positively impacted by the academic, athletic, and community resources we offer through our afterschool program. In 2017, Kids On Point served 60 students and their families through our core service, our daily afterschool program. 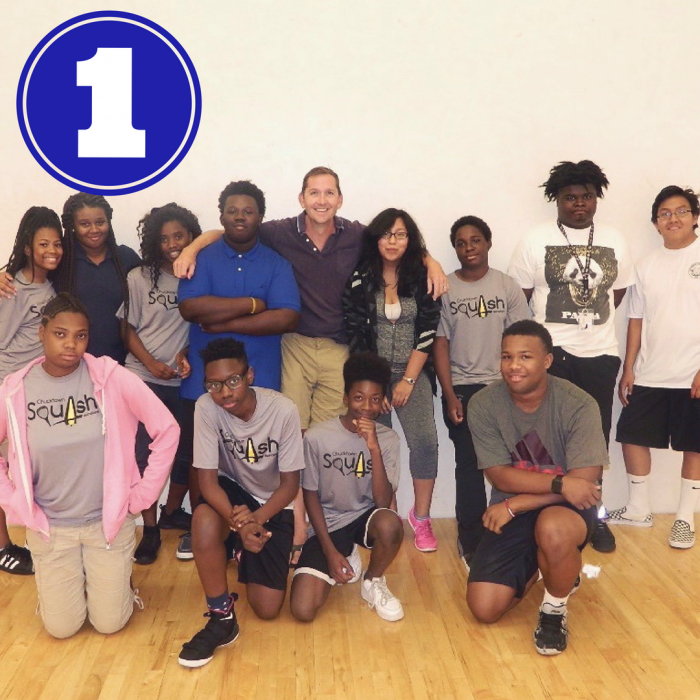 60 students, grades 3rd- 12th, participated in school-year programming in 2017, which includes daily squash instruction, academic tutoring, and mentorship–all at no cost to families. 2017 allowed us to bring a large group of new scholars onto the Kids On Point team. Along with scholars who have been with Kids On Point for years, we look forward to serving our growing team and their families in 2018 and the years to come. Kids On Point is committed to serving all scholars through their high school graduation, knowing that successful youth development happens over time with a consistent investment in a student’s life. In a monumental moment for Kids On Point, our original cohort of scholars applied to college in the Fall of 2017 (they were in 5th grade when Kids On Point was started!). Applying to college is no easy feat and our oldest scholars have been prepping and working with one of our partner organizations, College Sage, for over a year in order to submit their applications. Kids On Point carries out its mission everyday with high school graduation in mind. We are not only looking to provide our scholars with the resources that they need now, but we aim to equip scholars with the skills and resources they will need to be successful after high school graduation, too (read more about that here). 2017 was a key moment for us as we watched our oldest cohort successfully apply to college–and get in! Although we are anxiously awaiting more college decisions, Jerry and David (pictured above) have already been accepted to University of South Carolina. In 2017, our scholars collectively contributed just over 1,000 hours of service to the Charleston community. 1,000 hours!!! Kids On Point’s motto is “In the Classroom, In the Community, On the Court”. Over the past few years, Kids On Point has focused on growing partnerships with other nonprofits in Charleston in order to provide our scholars meaningful ways to be engaged in their community. We are incredibly proud that our 60 scholars paid it forward in total of 1,000 hours in 2017. 2017 projects included making window boxes with Fields to Families, beautifying Hampton Park with Youth Volunteer Corps Charleston, and making and delivering cards to homebound elderly downtown. We hope to top 1,000 hours in 2018! We changed our name in 2017! Chucktown Squash, as our organization has been known for quite a few years, became Kids On Point and introduced a new logo and a stunning new website. Our name change was borne of a desire to better market our organization as a nonprofit that does much more than only squash. 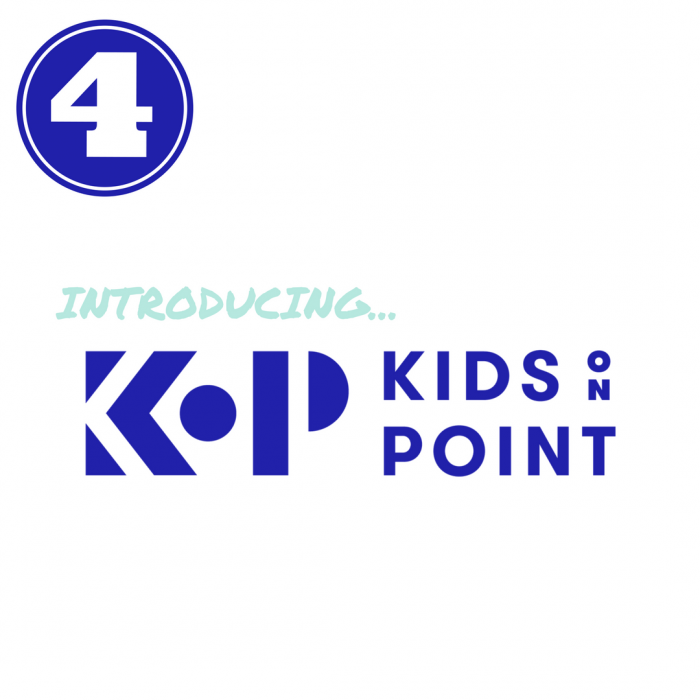 Kids On Point reflects that our organization is holistically serving the needs of students in Charleston through athletic, academic, and life skill preparation. Chucktown Squash has grown and evolved since its inception in 2009, but it has remained an organization loyal to its founding mission. This rebranding was in line with the work that Kids On Point has always been about, which is to open up the world of opportunity to youth from under-resourced schools and neighborhoods. Our name changed in 2017, but our mission did not. In 2017, our scholars attended 4 national squash events! 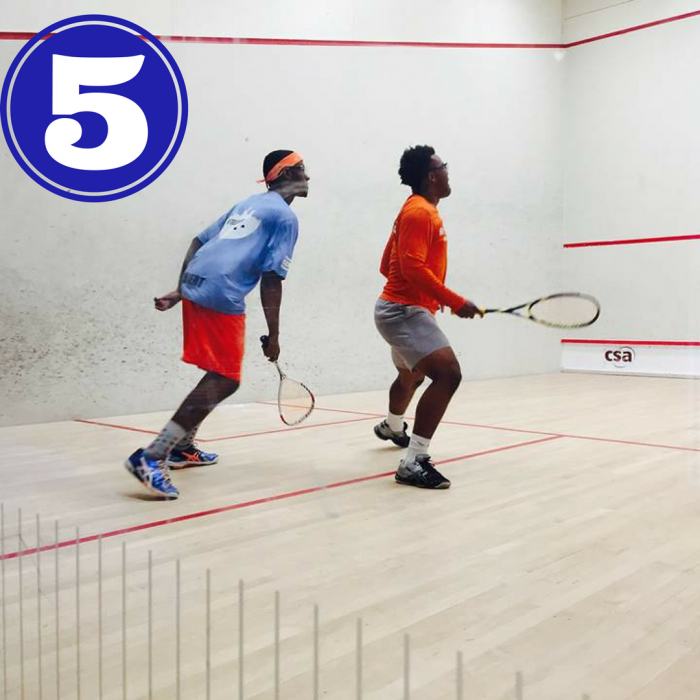 As a small squash nonprofit located deep in the South, it is not often that our scholars get to compete against other students at squash events. As our organization has grown, we have been able to send more and more scholars to tournaments and camps, further exposing them to the world outside their neighborhoods while giving them invaluable athletic experience as they grow their squash games. In 2017, Kids On Point scholars competed in two tournaments outside South Carolina, including attending the Squash + Education Alliance‘s Urban Individuals tournament at Amherst College in Massachusetts. In addition to tournaments, some of our high school scholars attended Squash + Education Alliance camps at Stanford University and University of Virginia. A huge thanks to our supporters who believe in these experiences and donate to Kids On Point to make these opportunities possible for scholars. These are some of our favorite Kids On Point accomplishments of 2017! 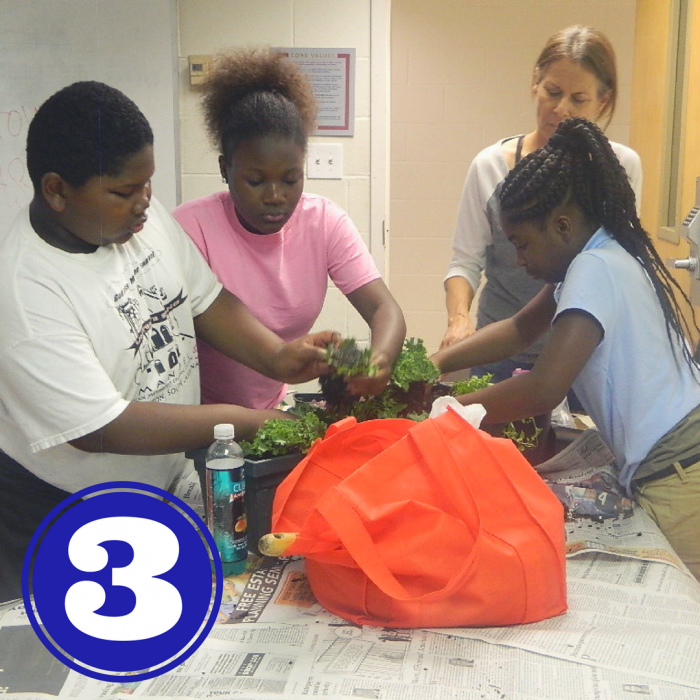 It is not too late to make a year-end gift to support KOP as we move into another incredible year of connecting youth with the resources they need to succeed. Find out how to support Kids On Point in 2018 by visiting the Contribute Page on our website. Give us a like on Facebook or follow us on Instagram–don’t miss out on all the accomplishments that are still to come! We are looking forward to a bright 2018. Thanks for being part of our Family this year. Sign up for the Kids on Point newsletter to hear about what our students are up to and how you can get involved.